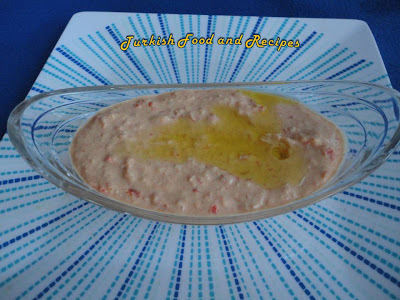 Place boiled or canned chick peas into a food processor or use a blender to form a puree. Then, add the roasted red peppers and blend with pureed chick peas. Add the rest of the ingredients and mix them all. Drizzle some olive oil on top and serve Humus with warm pita bread or chips. Haslanmis ya da konserve nohutlari blendir ile pure haline getirin. Daha sonra kozlenmis kirmizi biberi de ilave edip tekrar pure edin. Geri kalan malzemeleri ilave edin ve guzelce karistirin. Uzerine biraz zeytinyagi akitin ve sicak pide ya da lavas ile servis yapabilirsiniz. I must say that I like hummus with additions.